£89pp deposit. 0% interest. Pay Monthly. The superb tree lined slopes offer picture postcard scenery, wide nursery slopes and huge choice of greens and blues make it perfect for beginners and children, and the intermediates and advanced have a good choice of runs too, and the off piste opportunities are huge. All topped with cosy cafes and pubs, mountain restaurants offering a great selection of food and drink at a price that will never break the bank make this a destination hard to beat. Bulgaria is made up of 3 main resorts.... Borovets, Pamporovo and Bansko, let me tell you a little about each. Borovets is a popular resort for all levels of skier, with over 60 km of piste, particularly popular with beginners, with a famous English speaking ski school helping you explore the mountainside and helping you progress quickly to a good level at bargain prices. Intermediates have a great choice of runs running from the summit, through the forest and back to your door and advanced will enjoy the famous World Cup run of Yastrebets, and the off piste opportunities too. Snowboarders are well catered for too with this resort that lends itself to all levels. The pretty town centre comes alive at night, offering a great selection of bars and restaurants, whether you want lively of traditional, Borovets has it all, not to mention the massive choice of non ski activities too. Bansko is one of Europe's newest resorts, offering modern accommodation and a fantastic new lift system, taking you up to some of the most amazing scenic piste. With runs as high as 2500m, offers some fantastic conditions, beautiful powder snow and a great choice of piste regardless of your level and ability. Advanced skiers may find they are limited for black runs but the off piste choices are endless. Bansko offers some marvellous spa facilities and non ski activities. The apres ski is a selection of bars and tavernas, known as Mehanas offering a warm traditional atmosphere rather than lively. Pamporovo is probably the most scenic of the Bulgarian ski resorts, set amongst the pine forests, making skiing exciting, challenging and stunning all at the same time. Pamporovo has long sunny days and wide nursery slopes making it a perfect destination for families and beginners. Also excellent for groups as the resort has excellent value for money accommodation, a great apres ski, with a great selection of lively bars and restaurants with a traditional feel. Advance skiers will find things a bit limited here, definitely a resort suited to beginners and intermediates. Bulgaria is excellent value for money, food and drink are easily available, an average 3 course meal will cost approximately £10 a head and a bottle of locally produced wine is approximately £4. The choice of accommodation ranges from 2 star to 5 stars and suits all budgets and tastes. So for a ski holiday, hard to beat where money is concerned...try Bulgaria, its simply perfect. 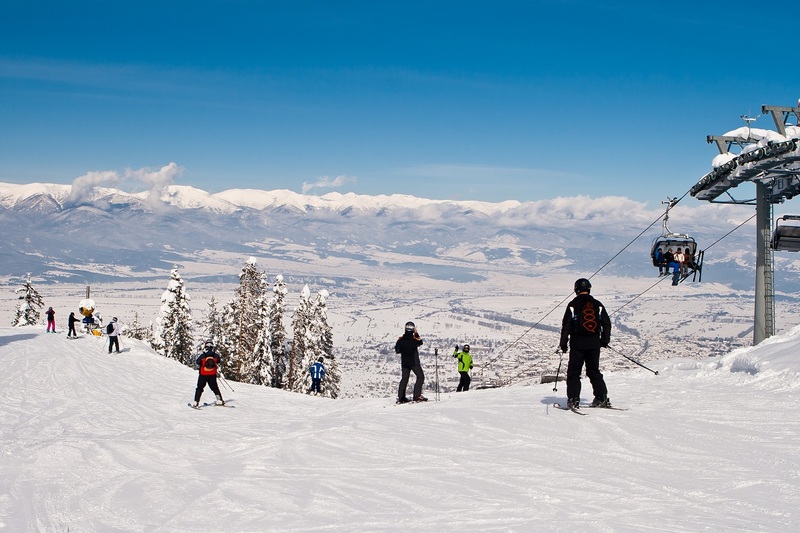 Bulgaria is the largest and most popular ski resort in Eastern Europe. It offers fantastic skiing and snow conditions throughout the whole of the ski season which starts in December and ends in April. Getting to Bulgaria is easily accessible from most UK airports with a flying time of approximately 3 and a half hours and a transfer time of approximately 3 hours. All the main Tour Operators feature Bulgaria in there ski programme. Accommodation in Bulgaria is varied from 2 star through to 5 star skiing & all inclusive ski holidays, depending on the budget, to small intimate self contained lodges and bed and breakfasts. You can be as close to the resorts amenities as you want or if you prefer to be further out and take in the fantastic scenery that Bulgaria has to offer it is simply breath taking. Most hotels are on half board but if you want to eat there is a restaurant to suit everyone`s taste. Now onto the most important thing the skiing! Basically whatever level of skier you are Bulgaria will cater for you offering gentle nursery slopes ideal for beginners and young children, to the thrill seeking black runs and off piste mogul runs. If you require ski school the instructors here a fantastic and speak in very good English. If you are a non-skier there a various activities within each resort to keep you entertained from ice skating to swimming and shopping to hiking. The cost of getting to Bulgaria is so reasonable in comparison to other ski resorts in Europe and it still uses its own currency the Bulgarian Lev which makes it very cost effective especially for short breaks. We advise you take Sterling with you but Euros are also accepted. For families and first time skiers this has got to be the first choice ski destination for price alone and not to mention the facilities the resorts have on offer. To find out more about the different resorts in Bulgaria and our featured deals click through here. Catered Chalet - Breakfast, afternoon tea and evening meals with wine, served in your chalet. Bed and Breakfast - Package includes your accommodation and breakfast. Half Board - Breakfast and your main evening meal. Drinks not included. Self Catered - A room with cooking facilities, restaurant access and room service. Full Board - Breakfast, lunch and your main evening meal. Drinks not included. All Inclusive - Room, breakfast, lunch, evening meal and all your drinks included. Room Only - Room service and restaurant, with extra costs. Ski Swift are an independent travel agent based in the North East of the UK. We make booking your next skiing holiday easy. Just pick where you want to go and where you’d like to stay, and we’ll do the rest. With all the major resorts covered, like France, Italy, Austria, Norway, Switzerland, Canada and more, you’ll find the perfect ski trip right here. Find out more! Call 0191 523 1917 between 8am-8pm. Read the Ski Swift Blog for some great hints and tips. Ski Swift is an Accredited Body Member of Hays Travel Limited, ATOL 5534.